This is one of my fave little books, brilliant for introducing group Bible study. With a little bit of background knowledge it’s possible to grasp what this book is all about, tick it off and get going on the other 65. Living out its message, of course, takes longer, but it’s always good for people to be able to say ‘OK, understand that’. So what do we know about the background? Not a lot. Who was Obadiah? No idea. When might it have been written? We’ll come to that. Next question: who is this prophecy about? V 1 tells us it’s aimed at Edom, a nation who lived due south of Judah next to the Dead Sea. There are a few more clues to Edom’s location: the people live ‘in the clefts of rocks’, ‘on the heights’, ‘among the stars’ where the eagles soar. Not Lincolnshire, then. Note too that the people are called ‘Esau’, so they are the descendents of Jacob’s cheated brother, and so not always best friends with the Israelites. What will happen to this nation? They will be totally ransacked by God’s judgement. If it were only human invaders things would be slightly better, but upset God and you’re in deep muck. And the fact that you think you’re unconquerable (v 3) only shows how much you underestimate God. Now those who have visited the Holy Land may by now be picking up some clues, particularly if I tell you that in Hebrew ‘edom’ means ‘red’. (Esau was by all accounts a ginger.) 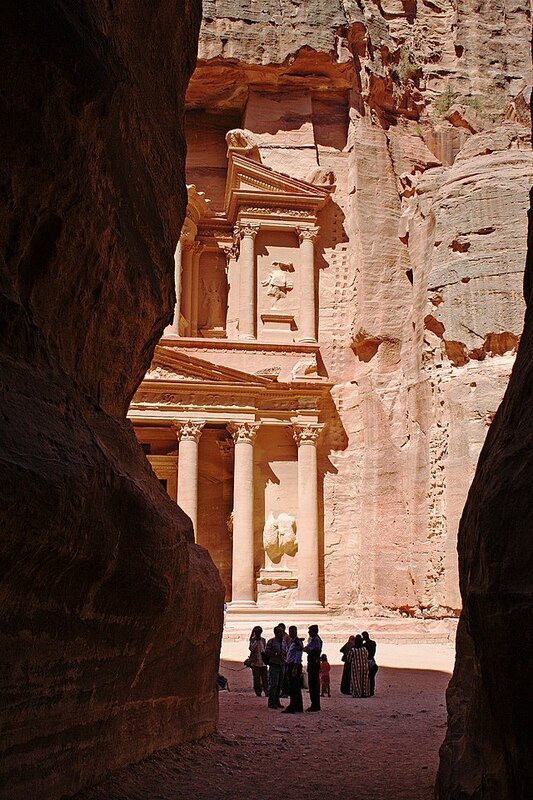 What we’ve got here is the capital city, Petra, carved high in the red sandstone mountains of the Negev, accessible only by a narrow defile, called the Siq, only a few metres wide, and therefore extremely easy to defend. But not against God. So what great crime did Edom commit to incur their judgement? Reconstructing v 10-16 the scenario seems to be that when Judah, their neighbours, were under attack (almost certainly as they were being carried off into exile in Babylon, which helps no end with the dating of this prophecy) Edom, rather than coming to their aid, stood at a distance and gloated, then helped mop up a few survivors and handed them over to the attackers, and then marched into the deserted city to loot what was left, desecrating the Temple as they went. It’s been said that evil triumphs when good people do nothing. But to add active insult to passive injury makes things even worse. There is an implicit warning here for those who do nothing while others suffer. I recently led a study on this book in a Homegroup, at around the time that the Christian Church in Syria, Baghdad and other parts of the Middle East was undergoing virtual wipeout at the hands of Islamic State murderers, and we couldn’t help but wonder how our brothers and sisters viewed the Church in the West, and whether this very book which we were studying in the comfort of our nice homes was speaking to them of us. It’s a deeply challenging book, inviting us to stand up against injustice and violence wherever we can, and warning us against believing that we’re safe and secure here where no-one can touch us.